​THE COURTHOUSE CLOCK CHIMED SEVEN TIMES. The echoes of the chimes faded. Warm summer twilight here in upper Illinois country in this little town deep far away from everything, kept to itself by a river and a forest and a meadow and a lake. The sidewalks still scorched. The stores closing and the streets shadowed. And there were two moons; the clock moon with four faces in four night directions above the solemn black courthouse, and the real moon rising in vanilla whiteness from the dark east. In the drugstore fans whispered in the high ceiling. In the rococo shade of porches, a few invisible people sat. Cigars glowed pink, on occasion. Screen doors whined their springs and slammed. On the purple bricks of the summer-night streets, Douglas Spaulding ran; dogs and boys followed after. The boys loped away. Waving after them quietly, Lavinia Nebbs sat all alone with a tall cool lemonade in her white fingers, tapping it to her lips, sipping, waiting. She turned and there was Francine, all in snow white, at the bottom steps of the porch, in the smell of zinnias and hibiscus. They walked down the street. “Where you going, girls?” cried Miss Fern and Miss Roberta from their porch over the way. “Oh, bosh!” Lavinia heard the old women’s door bang and lock, and she drifted on, feeling the warm breath of summer night shimmering off the oven-baked sidewalks. It was like walking on a hard crust of freshly warmed bread. The heat pulsed under your dress, along your legs, with a stealthy and not unpleasant sense of invasion. They stood upon the edge of the ravine that cut the town half in two. Behind them were the lit houses and music, ahead was deepness, moistness, fireflies and dark. ​Lavinia looked and the ravine was a dynamo that never stopped running, night or day; there was a great moving hum, a bumbling and murmuring of creature, insect, or plant life. It smelled like a greenhouse, of secret vapors and ancient, washed shales and quicksands. And always the black dynamo humming, with sparkles like great electricity where fireflies moved on the air. “It’s early. Lonely One won’t be out till late.” Lavinia took the other’s arm and led her down and down the crooked path into the cricket warmth and frog sound and mosquito-delicate silence. They brushed through summer-scorched grass, burs prickling at their bare ankles. They turned a curve in the path—and there it was. In the singing deep night, in the shade of warm trees, as if she had laid herself out to enjoy the soft stars and the easy wind, her hands at either side of her like the oars of a delicate craft, lay Elizabeth Ramsell! The woman lay as if she had floated there, her face moonlit, her eyes wide and like flint, her tongue sticking from her mouth. Lavinia stood in the middle of a thousand warm shadows with the crickets screaming and the frogs loud. “We’d better get the police,” she said at last. Lavinia held Francine and the policemen were brushing through the crackling grass, flashlights ducked about, voices mingled, and the night grew toward eight-thirty. “It’s like December. I need a sweater,” said Francine, eyes shut, against Lavinia. Lavinia and Francine walked away from the police and the sheet over the delicate thing upon the ravine grass. Lavinia felt her heart going loudly in her and she was cold, too, with a February cold; there were bits of sudden snow all over her flesh, and the moon washed her brittle fingers whiter, and she remembered doing all the talking while Francine just sobbed against her. “No, we’ll make it,” said Lavinia to nobody, and they walked on. They walked through the nuzzling, whispering ravine, the ravine of whispers and clicks, the little world of investigation growing small behind them with its lights and voices. “I’ve never seen a dead person before,” said Francine. ​They started up the ravine side, on the stony path, in the dark. And suddenly there, barring their way, standing very still in one spot, not seeing them, but looking on down at the moving lights and the body and listening to the official voices, was Douglas Spaulding. He stood there, white as a mushroom, with his hands at his sides, staring down into the ravine. “Get home!” cried Francine. He did not hear. Douglas jerked his head, stared at them as if they were not there. His mouth moved. He gave a bleating sound. Then, silently, he whirled about and ran. He ran silently up the distant hills into the warm darkness. Francine sobbed and cried again and, doing this, walked on with Lavinia Nebbs. The three young women stood in the summer night looking at each other. “I’ve got a notion to go in the house and lock the doors,” said Helen at last. The three women moved along the street under the black trees, past suddenly locked houses. How soon the news had spread outward from the ravine, from house to house, porch to porch, telephone to telephone. Now, passing, the three women felt eyes looking out at them from curtained windows as locks rattled into place. How strange the popsicle, the vanilla night, the night of close-packed ice cream, of mosquitolotioned wrists, the night of running children suddenly veered from their games and put away behind glass, behind wood, the popsicles in melting puddles of lime and strawberry where they fell when the children were scooped indoors. Strange the hot rooms with the sweating people pressed tightly back into them behind the bronze knobs and knockers. Baseball bats and balls lay upon the unfootprinted lawns. A half-drawn, white-chalk game of hopscotch lay on the broiled, steamed sidewalk. It was as if someone had predicted freezing weather a moment ago. “We’re crazy being out on a night like this,” said Helen. A shadow fell across their terrified faces. A figure loomed behind a tree. As if someone had struck an organ a terrible blow with his fist, the three women gave off a scream, in three different shrill notes. “Got you!” roared a voice. The man plunged at them. He came into the light, laughing. He leaned against a tree, pointing at the ladies weakly, laughing again. “Hey! I’m the Lonely One!” said Frank Dillon. Francine began to cry hysterically. They moved. He moved to follow. “Stay right there, Mr. Lonely One, and scare yourself. Go take a look at Elizabeth Ramsell’s face and see if it’s funny. Good night!” Lavinia took the other two on along the street of trees and stars, Francine holding a kerchief to her face. The drugstore was a small pool of sluggish air which the great wooden fans stirred in tides of arnica and tonic and soda-smell out onto the brick streets. “I need a nickel’s worth of green peppermint chews,” said Lavinia to the druggist. His face was set and pale, like all the faces they had seen on the half-empty streets. “For eating in the show,” said Lavinia as the druggist weighed out a nickel’s worth of the green candy with a silver shovel. “Man sitting at the counter—watched you walk out. Said to me, ‘Say, who’s that?’ Why, that’s Lavinia Nebbs, prettiest maiden lady in town, I said. ‘She’s beautiful,’ he said. ‘Where does she live?’ ” Here the druggist paused uncomfortably. “I guess I didn’t think. I said, ‘Oh, over on Park Street, you know, near the ravine.” A casual remark. But now, tonight, them finding the body, I heard a minute ago, I thought, My God, what’ve I done!” He handed over the package, much too full. “You fool!” cried Francine, and tears were in her eyes. Lavinia stood with the three people looking at her, staring at her. She felt nothing. Except, perhaps, the slightest prickle of excitement in her throat. She held out her money automatically. “There’s no charge on those peppermints,” said the druggist, turning to shuffle some papers. “It was just a man,” said Lavinia, turning in a slow circle to look at the town. he first showing was over, intermission was on, and the dim auditorium was sparsely populated. The three ladies sat halfway down front, in the smell of ancient brass polish, and watched the manager step through the worn red velvet curtains to make an announcement. “That means us, Lavinia!” whispered Francine. The lights went out. The screen leaped to life. One by one the three women turned to look. They saw a white face there, flickering with unholy light from the silver screen. It seemed to be all men’s faces hovering there in the dark. “Helen, come back!” cried Lavinia, rising. They tapped their empty soda glasses down, each with a vanilla mustache on their upper lip, which they found with their tongues, laughing. “I’m sorry,” said Helen faintly. The clock said eleven-thirty now. They had come out of the dark theater, away from the fluttering rush of men and women hurrying everywhere, nowhere, on the street while laughing at Helen. Helen was trying to laugh at herself. “I apologized,” said Helen, looking up at the great fan still whirling, whirling the warm late night air, stirring, restirring the smells of vanilla, raspberry, peppermint and Lysol. “Closing up, ladies.” The druggist switched off the lights in the cool white-tiled silence. Outside, the streets were swept clean and empty of cars or trucks or people. Bright lights still burned in the small store windows where the warm wax dummies lifted pink wax hands fired with blue-white diamond rings, or flourished orange wax legs to reveal hosiery. The hot blueglass eyes of the mannequins watched as the ladies drifted down the empty river bottom street, their images shimmering in the windows like blossoms seen under darkly moving waters. There were a thousand people in the windows, stiff and silent, and three people on the street, the echoes following like gunshots from store fronts across the way when they tapped their heels on the baked pavement. A red neon sign flickered dimly, buzzed like a dying insect, as they passed. Baked and white, the long avenues lay ahead. Blowing and tall in a wind that touched only their leafy summits, the trees stood on either side of the three small women. Seen from the courthouse peak, they appeared like three thistles far away. And so they walked, they drifted like three prim clothes forms over a moonlit sea of lawn and concrete, Lavinia watching the black trees flit by each side of her, listening to the voices of her friends murmuring, trying to laugh; and the night seemed to quicken, they seemed to run while walking slowly, everything seemed fast and the color of hot snow. They sang sweetly and quietly, arm in arm, not looking back. They felt the hot sidewalk cooling underfoot, moving, moving. They listened to the summer night. The summer-night crickets and the far-off tone of the courthouse clock making it eleven forty-five. Lavinia listened. A porch swing creaked in the dark and there was Mr. Terle, not saying anything to anybody, alone on his swing, having a last cigar. They saw the pink ash swinging gently to and fro. Now the lights were going, going, gone. The little house lights and big house lights and yellow lights and green hurricane lights, the candles and oil lamps and porch lights, and everything felt locked up in brass and iron and steel, everything, thought Lavinia, is boxed and locked and wrapped and shaded. She imagined the people in their moonlit beds. And their breathing in the summernight rooms, safe and together. And here we are, thought Lavinia, our footsteps on along the baked summer evening sidewalk. And above us the lonely street lights shining down, making a drunken shadow. “Lavinia, Helen, stay here tonight. It’s late, almost midnight now. You can sleep in the parlor. I’ll make hot chocolate—it’ll be such fun!” Francine was holding them both now, close to her. And Francine began to cry. “Oh, not again, Francine,” said Lavinia. “Good night, good night!” Rushing upstairs, Francine whisked behind a door, which slammed to be snap-bolted tight on the instant. The courthouse clock struck the hour. The sounds blew across a town that was empty, emptier than it had ever been. Over empty streets and empty lots and empty lawns the sound faded. “Nine, ten, eleven, twelve,” counted Lavinia, with Helen on her arm. “Don’t you feel funny?” asked Helen. The sound of the deep warm dark ravine came near. She heard the man’s voice. A man’s voice singing far away among the trees. She walked a little faster. Down the street in the dim moonlight a man walked slowly and casually along. And that’s who it was, of course. She went on, leaving him under a light, humming to himself, alone. Here I am, she thought. 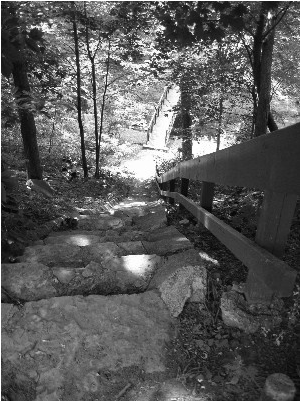 She stood on the edge of the one hundred and thirteen steps that went down the steep hill and then across the bridge seventy yards and up the hills leading to Park Street. And only one lantern to see by. Three minutes from now, she thought, I’ll be putting my key in my house door. Nothing can happen in just one hundred eighty seconds. She started down the long dark-green steps into the deep ravine. “One, two, three, four, five, six, seven, eight, nine, ten steps,” she counted in a whisper. She felt she was running, but she was not running. “Fifteen, sixteen, seventeen, eighteen, nineteen, twenty steps,” she breathed. “One fifth of the way!” she announced to herself. The ravine was deep, black and black, black! And the world was gone behind, the world of safe people in bed, the locked doors, the town, the drugstore, the theater, the lights, everything was gone. Only the ravine existed and lived, black and huge, about her. She listened to her shoes on the steps. She screamed. It was like nothing she’d ever heard, that scream. She had never screamed that loud in her life. She stopped, she froze, she clung to the wooden banister. Her heart exploded in her. The sound of the terrified beating filled the universe. Nothing, she thought, holding her heart. Nothing. Fool! That story I told myself. How silly. What shall I do? Shall I call the officer—did he hear me scream? I’ll go the rest of the way. That silly story. She began again, counting the steps. She took a step. There was an echo. Another echo. Another step, just a fraction of a moment later. A step and an echo. The crickets were listening. The night was listening to her. For a change, all of the far summer-night meadows and close summer-night trees were suspending motion; leaf, shrub, star, and meadow grass ceased their particular tremors and were listening to Lavinia Nebbs’s heart. And perhaps a thousand miles away, across locomotive-lonely country, in an empty way station, a single traveler reading a dim newspaper under a solitary naked bulb, might raise up his head, listen, and think, What’s that? and decide, Only a woodchuck, surely, beating on a hollow log. But it was Lavinia Nebbs, it was most surely the heart of Lavinia Nebbs. Silence. A summer-night silence which lay for a thousand miles, which covered the earth like a white and shadowy sea. Faster, faster! She went down the steps. She heard music. In a mad way, in a silly way, she heard the great surge of music that pounded at her, and she realized as she ran, as she ran in panic and terror, that some part of her mind was dramatizing, borrowing from the turbulent musical score of some private drama, and the music was rushing and pushing her now, higher and higher, faster, faster, plummeting and scurrying, down, and down into the pit of the ravine. Only a little way, she prayed. One hundred eight, nine, one hundred ten steps! The bottom! Now, run! Across the bridge! She told her legs what to do, her arms, her body, her terror; she advised all parts of herself in this white and terrible moment, over the roaring creek waters, on the hollow, thudding, swaying almost alive, resilient bridge planks she ran, followed by the wild footsteps behind, behind, with the music following, too, the music shrieking and babbling. He’s following, don’t turn, don’t look, if you see him, you’ll not be able to move, you’ll be so frightened. Just run, run! She ran across the bridge. Oh, God, God, please, please let me get up the hill! Now up the path, now between the hills, oh God, it’s dark, and everything so far away. If I screamed now it wouldn’t help; I can’t scream anyway. Here’s the top of the path, here’s the street, oh, God, please let me be safe, if I get home safe I’ll never go out alone; I was a fool, let me admit it, I was a fool, I didn’t know what terror was, but if you let me get home from this I’ll never go without Helen or Francine again! Here’s the street. Across the street! She crossed the street and rushed up the sidewalk. Oh God, the porch! My house! Oh God, please give me time to get inside and lock the door and I’ll be safe! And there—silly thing to notice—why did she notice, instantly, no time, no time—but there it was anyway, flashing by—there on the porch rail, the half-filled glass of lemonade she had abandoned a long time, a year, half an evening ago! The lemonade glass sitting calmly, imperturbably there on the rail,. . . and . . .
She heard her clumsy feet on the porch and listened and felt her hands scrabbling and ripping at the lock with the key. She heard her heart. She heard her inner voice screaming. Unlock the door, quick, quick! Now, inside. Slam it! She slammed the door. “Now lock it, bar it, lock it!” she gasped wretchedly. The door was locked and bolted tight. The music stopped. She listened to her heart again and the sound of it diminishing into silence. Home! Oh God, safe at home! Safe, safe and safe at home! She slumped against the door. Safe, safe. Listen. Not a sound. Safe, safe, oh thank God, safe at home. I’ll never go out at night again. I’ll stay home. I won’t go over that ravine again ever. Safe, oh safe, safe home, so good, so good, safe! Safe inside, the door locked. Wait. Why, there’s no one there at all! Nobody. There was nobody following me at all. Nobody running after me. She got her breath and almost laughed at herself. It stands to reason If a man had been following me, he’d have caught me! I’m not a fast runner. . . . There’s no one on the porch or in the yard. How silly of me. I wasn’t running from anything. That ravine’s as safe as anyplace. Just the same, it’s nice to be home. Home’s the really good warm place, the only place to be. She put her hand out to the light switch and stopped. ​Behind her in the living room, someone cleared his throat.